Combine admission to two popular London attractions: Shakespeare's Globe Theatre and a sightseeing cruise on the River Thames. 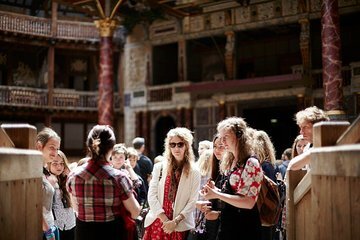 Learn about Elizabethan London on a guided tour of the reconstructed theater and see how Shakespeare's plays were staged at the Globe Exhibition. During a hop-on, hop-off river cruise, you’ll view major landmarks such as Big Ben and London Eye. Please note: Customers must first collect their attraction vouchers from a City Cruises Pier, which are Westminster, Tower or Greenwich. Customers cannot enter the attraction prior to collecting their entrance tickets from the pier. Attraction tickets cannot be collected from the London Eye Pier. The Globe and globe tour was most excellent, no complaints.The tour guide on the boat was likewise informative and entertaining.I take off two full stars b/c the write up advertises that you can disembark on the pier right outside the Globe and YOU CANNOT. We had to get off at the tower of London and hoof it back to the Globe, not exactly a short hike. Otherwise, I'd rate 5/5. The Globe Theater was a great tour and our guide was very knowledgeable and entertaining. He included many a history lesson on London while showing us the theater. We purchased this tour in conjunction with the hop on/hop off river cruise. LOVED the river cruise. We boarded at Westminister early in the morning and our crew was lively, informative, and kept up a commentary on the places we passed. Very interesting history. It should be noted that the river cruise no longer stops at the advertised location that is close to the Globe Theater so we actually had to exit at a different stop and call an Uber to take us to the Theater. Minor inconvenience, but not what we had expected. We rode the cruise all the way to Greenwich and stayed there for about 2 hours exploring this wonderful little town that we really knew nothing about. Wish we could have stayed a bit longer, but we had other things to do that day. The crew on the return cruise was not as involved with the passengers and did not provide much commentary on the sights. I highly recommend the cruise and that you take advantage of the stops along the way to explore the areas. So interesting and there is so much to see. Lovely tour. Fresh pastries at the snack center. I was surprised to discover the cruise ticket was a two day pass to go on the cruises all day! I was not able to do the tour as it was closed for renovation. There were some glitches. The print out from Viator was not recognized by the folks on the ship. After wandering from ship to ship we were directed to a ticket area. The host did not, in fact, stop near the Globe. No one on the boat had heard of our particular ticket. We got off at the Tower slip and walked to the Globe. Trying to return we were told the boat slip by the Globe would not go back to Westminster. Threw in the towel and walked to the tubes in Blackfriars. Globe tour was awesome. Boat was nice. Do them separately and buy them on the day when you are there. The Globe was impressive and the guide, they provided, was a bit pretentious, but maybe that was to be expected.It is a place to see if you love the theater. The bad part was that no place in the booking process did it say the Themes Cruise didn't stop at the Globe until later in the season and after our trip. That should have been made more clear! Amazing. Could not finish our tour unfortunately as we had an appointment to get to however, this is once place I would return to watch a play too. This is well worth going to. Nice river cruise and tour of the Globe Theater. We are happy we did it. Very enjoyable tour. Timing was flexible and we could visit the exhibition and take the cruise a time that suit our schedule.